Instagram Message: This gal can sit for hours playing Mahjong. Do you know how to play? Connecting people is thoughtful. Be honest..the scene from the Joy Luck Club movie came to mind when you read this week’s title, right? When I saw that scene in the movie, the feeling I had was validation. Like, “Oh yeah, I know exactly what this is all about.” I self-identified because I grew up with parents (especially my mom) who played the game Mahjong during any and all family gatherings. We would celebrate a birthday or spend time together at a designated Filipino family’s home. It was the ultimate playdate for adults and any child who was not old enough to drive. Sometimes these gatherings started at lunchtime but usually it was an evening event. There was always a huge spread - maybe potluck, maybe takeout - but guaranteed there would be a table full of food. It was never the long, drawn out, sit down type dinner. Instead, for the parents it was more like a “we-want-to-start-playing-asap-so-fill-your-body-with-as-much-food-as-you-can-because-it-will-be-hours-before-we-eat-again” kind of dinner. I don’t really remember my parents ever worrying if I ate or not. The parents’ primal instincts of taking care of themselves was totally acceptable because we all understood that this was going to be another Mahjong marathon. On these Mahjong nights, for the kids, it would be a total free for all. We ran around like wild animals. Eating what we wanted, when we wanted. Every parent was paying more attention to the tiles in front of them while they sat at a card table. It didn’t really matter if these card tables were set up in a garage or down in a basement, the parents would completely tune us out. And as a kid, my favorite part of these nights was staying up as late as we wanted because none of the parents ever stepped away from the Mahjong table to put their kids down for bed. In fact, I don’t even think they left the table to use the bathroom. So the kids just watched The Love Boat, Fantasy Island, Saturday Night Live and anything else that was inappropriate for a six year old on weekend nights. It was like heaven for us. There were many times my family would leave a party when the sun was coming up. As you may know, my mom lives with me now. 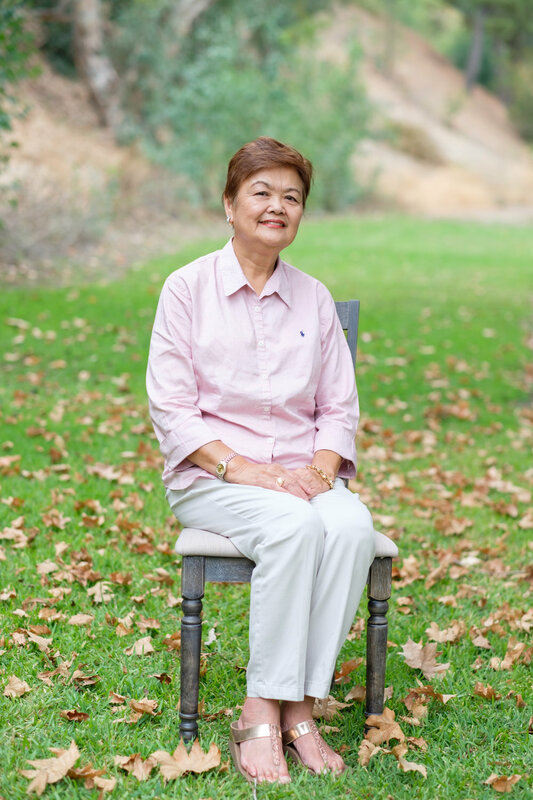 The process of asking her to move in took about two years because a big part of my mother’s social life is playing Bingo (click to read more) and Mahjong. I felt very selfish for asking her to give up her fun routines. Everything about her living with us seemed like a win-win EXCEPT missing friends/family and not being able to enjoy her favorite gaming activities. Last December, when my mom was visiting us, one of my neighbors offered to take her to Bingo. I thought that my typically shy mother would refuse to go because she barely knew this neighbor. Lo and behold! Not only did she accept the invitation but she practically jumped into the car when Carla showed up to take her. My mom didn’t come home until I was already in bed for the night. The next morning she recounted the evening like a school girl the day after Prom. This was the hope I needed to ask her to move in. My mom has been living with us since May 2017 but she didn’t really get settled in until October because she was in CA and traveled from July 1st thru the middle of September. Last month it hit me - my mom needed to have fun. 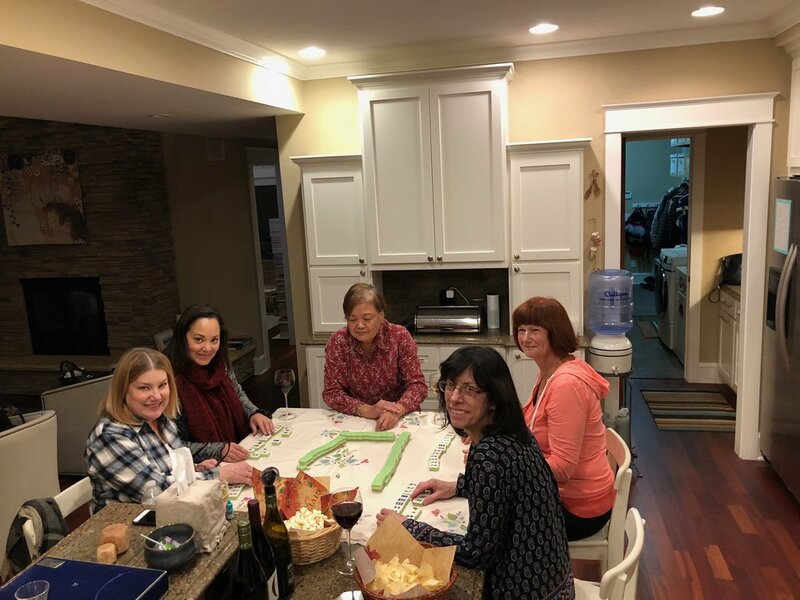 A couple of weeks ago, I invited the neighbor ladies to come over to our house to learn how to play Mahjong. I pre-warned our guests that I would purposely not be around for this “Wine + Mahjong lesson”. I knew if I stayed to co-host, my mom would be a shrinking violet and defer all the talking to me. Besides, I go on dates with the hub on Saturday nights so I wasn’t about to miss my date. As I was getting ready to go out that night some of the guests arrived. My mom went from shy gal to fun Mahjong instructor and barely looked up from the table to say good bye as we left for our date. Mission accomplished! These friends had never played Mahjong and wanted to see what it was all about. They came to the right house. My mom loves games and now that she has taught them the concept, it won't be long before she will be pulling all-nighters again. Mahjong Tip: Wine always helps to relax new students. Low stress spread. Nothing fancy because they are busy learning. For the first night, I made easy ham & cheese sliders, a Chinese slaw salad and put out homemade cookies (except the chocolate cookies from Rustica) for dessert because I was slammed and didn't have time to do much more. My mom made her potato salad. This past weekend I made the Marscapone, pomegranate, honey dip with crackers and an onion dip for potato chips. This upcoming weekend my mom will make Pancit for the players. Food, wine and a lesson. When I came home that night I asked how the night went and she was giddy like the prom girl again. It made me happy to see her happy. The next morning she shared that she couldn’t sleep because she kept thinking about ways to share her strategies with her buddies. That’s when I knew I had given my mom a great thoughtful pinch. Now we have an open door policy: most Saturday nights, the neighbors are welcome to come after 7p. They could bring what they want to eat, drink or not. They can come to play, watch or learn. The neighbors love it because they hang out together anyway - why not play a game, win a couple bucks or bragging rights and most of all, give my mom joy for doing what she loves to do? I thank Carla, Dana, Cathy and Patty for helping me get my mom's mojo back! What also makes me smile is that my kids see their Lola (grandmother) happy. My mom will teach my kids how to play Mahjong and give me a refresher course as soon as things settle down around here. We would be the perfect foursome to play (iPads and TV screen time get out of control some weekends) especially when the weather gets below zero around here. I’m sharing this thoughtful pinch with you because you may know someone that would light up like a Christmas tree if you helped nurture their hobbies, their interests, their favorite ways to past time. It didn’t take much effort on my end to set this up. I’m busy. I can’t go to the local casino, Bingo at the VW or stay home on a Saturday night to play Mahjong. Since I can’t do these things at this time, I found others who can and it seems to work out. Connecting people is thoughtful.